Sometimes the right way to get through a bad mood is to work it out—physically. But which workout do you choose when you're feeling angry? Depressed? Simply unsettled? We asked Sue Zajac, an exercise physiologist who specializes in exercise therapy at Saint Vincent Hospital's Wellness Center in Stratford, Connecticut, to suggest the best bad-mood busters. Exercise Prescription: Go for a walk. When you're fuming, Zajac says, the best thing is to take a brisk walk. "If you want to vent, bring a friend," she recommends. "But if you just need to burn off steam, then go by yourself." What you don't want to do, according to Zajac, is tackle a new exercise that could potentially frustrate you. 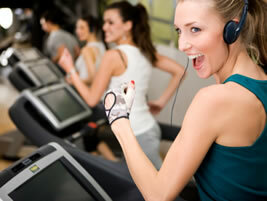 For example, don't go to your first Spinning class when you're angry; if you can't keep up, you'll become more enraged. Other activities Zajac suggests are jogging, riding an exercise bike, and swimming. Exercise Prescription: Get with a trainer. "If someone thinks little of himself, the best thing is to get into a one-on-one situation with a trainer," says Zajac. This relationship is beneficial because the exerciser continually gets feedback. Additionally, notes Zajac, personal trainers set realistic goals for their clients. "People exercising on their own may not do that. Then, when they can't live up their goals, they feel even worse." Exercise Prescription: Take a class or join a group. For those feeling blue, Zajac suggests getting involved in group exercise activities, such as an aerobics class or walking group. "It's important for depressed people to be around others," she says. "It helps them forget about their problems for a while." Hiring a personal trainer is also a good solution, says Zajac. A trainer can give both attention and motivation. Exercise Prescription: Start a meditative exercise program; sweat it out in a high-heart-rate activity; jump into a heated pool. "Yoga, tai chi, or any other meditative class works wonders for people who are anxious," says Zajac. "Stretching, breathing, and focusing are beneficial ways to combat tension." If you are so anxious that you can't sit still, Zajac suggests a super high intensity workout, such as cycling or running, to burn off tension, or swimming in a heated pool to relax body and mind. Recipe shows that low-fat fish doesn't have to mean low on flavor.